This printable Amusement Park Christmas Gift Tickets template is a great Christmas gift. Surprise them with tickets to an Amusement Park or Theme park. Easily personalize this printable ticket template at home. Simply open it in Adobe Reader and type over my sample text. All text is editable (except the “Merry Christmas”), so you can use it for any Amusement Park or Theme Park. It makes a great last minute Christmas gift too. Not sure of the date you will be going? Just type in TBA or similar and purchase the real tickets later. PDF file with 3 x tickets per page (each of the 3 tickets can be for a different recipient and/or park). Each ticket is 8 x 3.25 inches. Complete your Christmas Gift with this matching Ticket Sleeve. Download your printable Amusement Park Christmas Gift Tickets template immediately after your payment has been processed. Note that you cannot change the “Merry Christmas” text on this template. Trim out your Amusement Park Christmas Gift Tickets on the provided cut lines. These invitations are amazing, adorable and customizable. These are perfect for my kids’ joint circus birthday party and look amazing when printed out! Thank you so much for these super cute printables! These worked great for my son’s birthday party! Multiple uses for various tags and signs. Thanks! Turned out great! Super easy to edit! I had a question and it was answered VERY quickly! Having a joint carnival birthday party for a niece and nephew and this package made the decorating so stress-free! The templates are perfect for the event and can’t wait for the kids to see their names personalized on EVERYTHING! This invitation was perfection! Easy to customize on the spot after you download. The owner will also send you a free .jpg of your invitation – so great for sending out via text, email, social media, etc. I loved this cute vintage, funky-looking invitation! I looked through several and I was so excited when I found this. 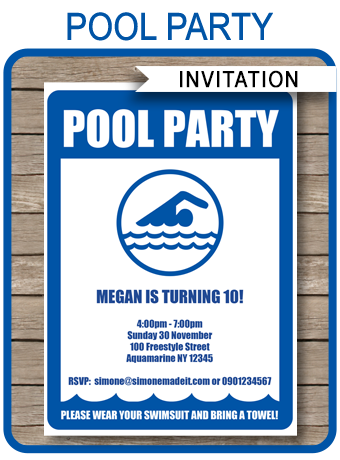 It was perfect for my 10-year-old daughter’s pool party invitations. I downloaded and entered my information then I printed it at home on white card stock! Worked great! So happy with how much time I saved!